Here is a one-year-old traditional clothbound cheddar that I made last October and recently unwrapped. It has been worth the wait. I am a cheesemaker and serious cook by avocation, living in Vermont. I find the technical challenges of cheesemaking to be very interesting, and the results..... most enjoyable! 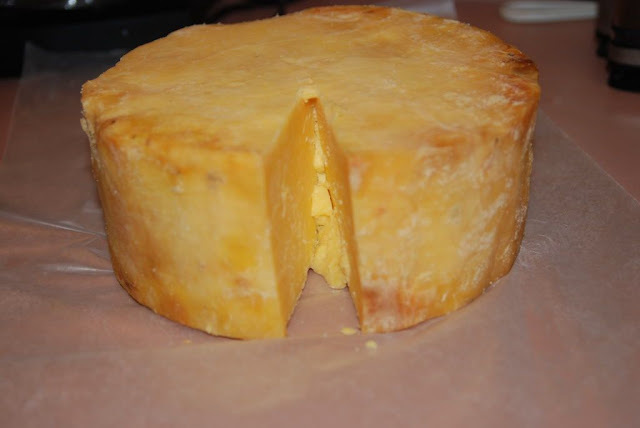 This cheddar has very desirable flavor and texture, and a golden color because of the grassfed raw Jersey milk it contains. For cheddar, the most important moment is just before salting; everything depends on it. Too much residual whey, and the cheese will be undersalted and too acid. But too much salt, and you will upset the balance in the other direction.